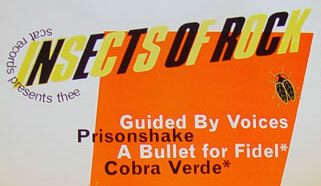 Two Guided By Voices shows – here’s what I know for sure one is from the Khyber – the second is from New York. The dates I have on the tape are June 23rd 1994 for Khyber and June 24, 1994 for New York. According to the GBV database and this flyer the New York show was on June 24th. According to Marc (thanks for the song titles as well): second NYC on is def Threadwaxing 1994.06.24: there is a Threadwaxing comp that features ‘Scientist’ and it’s the same version as he gives a little verbal intro that matches. If you haven’t picked it up yet – go buy the New GBV album. 06 Drinker’s Peace _ Break Even. Video from the first Guided By Voices show in Philadelphia. It was a Siltbreeze night at the Khyber with Temple of Bon Matin, Strapping Field Hands, Mike Rep, GBV and headlining was V3. I’ll put up the video from the other bands as I get it done. GBV along with Pavement where the two bands from the early 90’s that I thought had a really unique sound that I was really into. version of the band, had re-joined circa Propeller and soon became Pollard’s primary musical foil, in addition to contributing several of his own songs to the band’s catalog. The video was shot by Rich – Thanks to Mark Lux for the tape.